Along with other modern South and Central American states, Bolivia gained independence from Spain in the first half of the Nineteenth Century (1825). The newly independent country was named after Simon Bolivar, the famed South American nationalist and liberator, who was also the first President of the country. 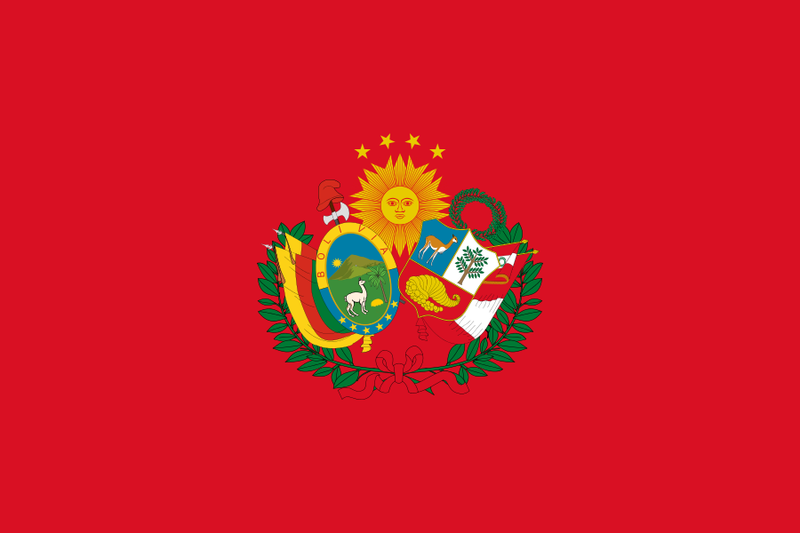 In 1836, Bolivia joined Peru in short-lived Peru–Bolivian Confederation, which was dissolved in 1839 after defeat by Argentina and Chile in the War of the Confederation. The war had started because of concerns, mainly on the part of Chile, caused by the power and strength the Confederation could muster and the possible threat to Chilean national interests. Following their defeat in the war, Peru turned on its former partner and tried to occupy Bolivia, but were decisively defeated at the Battle of Ingavi in 1841. Decades of economic decline and political instability followed for Bolivia and growing tensions with neighboring Chile came to a head with the War of the Pacific. Running from 1879 to 1883, the war resulted in Bolivia becoming landlocked and losing the nitrate-rich coastal region of the North Atacama Desert. The conflict had exacerbated Bolivia’s problems but the post-war decades saw an economic rise thanks to the production and export of silver, copper, lead, zinc and, most importantly, tin. However, Bolivia remained the poorest country of the continent. The early Twentieth century saw the beginning of German involvement in Bolivian military affairs, culminating with Hans Kundt’s appointment as head of the General Staff and later, Minister of War. The Chaco region was a low-lying, densely vegetated area sandwiched between Bolivia and Paraguay which had been disputed for several decades. The two landlocked countries sought control of the region because the Paraguay River flowed through it, giving access to the Atlantic Ocean. It was also rumored that oil could be found there. In 1928, border skirmishes known as the Vanguardia Incident broke out but, with both sides recognizing neither was ready for a full-scale war, a peace settlement brokered by the League of Nations was reached. Nevertheless, both countries remained bellicose and built up their forces in the region, triggering war in July 1932. Map of the fought over Chaco region. Photo: A de Quesada and P. Jowett (2011), p. 5. The war was the bloodiest twentieth century inter-state conflict of South America. In all, Bolivia mobilized between 56,000 and 65,000 troops (2% of the population) and Paraguay 36,000 troops (3.5% of the population). The hostilities can be defined as a “total war” with women being conscripted to take over men’s jobs in factories. As a side note, even peered reviewed academic journals are prone to enormous mistakes and misconceptions about this conflict. As an example, Michael Mcnerney’s “Military innovations during war: Paradox or paradigm?” claims that Bolivia had up to 200 tanks and 500 howitzers, which is obviously not true. Acting upon the advice of Hans Kundt, a deal was sought with the British arms company Vickers to buy modern military equipment, aircraft and tanks. Kundt was a German who was Minister of War and Commander in Chief of the Bolivian forces, having previously been a Lieutenant General in the German Army during WWI. Originally, the contract was going to be worth GB £3 million and include 12 tanks plus aircraft. However, the financial crisis caused by the 1929 Stock Exchange Crash meant that a new, more austere deal had to be struck. In the end, this agreement, concluded in October 1932, was worth somewhere between GB £1.25 million and GB £1.87 million and included 196 artillery pieces, 36,000 rifles, 6,000 carbines, 750 machine-guns, 2.5 million rounds of ammunition, 10,000-20,000 shells, 12 warplanes and 5 tanks – 3 Vickers Mk. E’s and 2 Vickers Carden Loyd Mk.VI’s. However, not all that was agreed to was sent and what was sent was of dubious quality. To make matters worse, Argentina and Chile, who supported Paraguay, blocked the shipments in their ports. 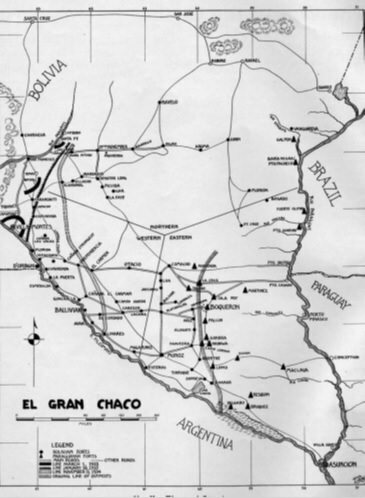 Once they reached Bolivia, poor internal transport routes to the Chaco meant that the Mk.E’s did not arrive at the frontline until December 20th 1932, several months after the beginning of hostilities. Bolivia then became the third nation on the continent to acquire armored fighting vehicles after Brazil (12 Renault FT’s bought in 1921) and Argentina (6 Vickers Crossley Armoured Cars). Scholarship on the use of tanks in this conflict is limited and patchy, but there are indications that Vickers Carden Loyd Mk.VI tanks were used as early as 1932, though, the most universally accepted tank debut on the continent took place in July 1933 at the 2nd Battle of Nanawa. 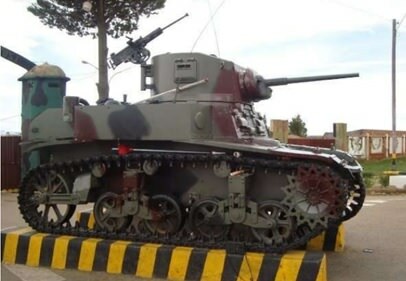 One Mk.E and one Carden-Loyd were lost while the remaining two Mk.E’s were captured by the Paraguayans in December 1933 during the retreat after the Second Battle of Alihuatá. The fate of the other Carden-Loyd is unknown. The Mk.E’s, and more specifically the Type B’s, proved their worth owing to their engine and suspension being effective in the harsh conditions of the Chaco. Their armor was sufficient to defend themselves from Paraguayan small arms fire, whilst the armament ripped through the Paraguayan fortifications. Despite this, lack of availability meant they were not used in large enough numbers, and their tactical use as independent entities in support of infantry, which had not been trained in how to fight alongside them, proved to be inefficient. An example of this was at the 2nd Battle of Nanawa where a single Mk.E Type B penetrated the Paraguayan defensive line but had to retreat due to lack of infantry support in fear of being surrounded, overwhelmed and captured. Moreover, the heat, rising to as high as 50ºC, made fighting difficult and meant they had to fight with open hatches creating vulnerable spots. Photo of the Bolivian Type A in December 1933. Photo: A de Quesada and P. Jowett (2011), p. 35. Sometime before the end of the war, up to 14 Italian Fiat-Ansaldo Carro Veloce L3/33’s (CV-33) are alleged to have been bought and they reputedly took part in the last battle of the war at Villamontes, which took place between January and June 1935. There is no evidence to prove this and their fate is also unknown. Furthermore, for years, there were unproven reports of a Renault FT being used by Bolivia. What is known is that a single demonstration example was in La Paz in 1931. It is more than probable that it was never deployed and, yet again, its fate is unknown. Bolivia was soundly defeated in the war and was forced to cede ¾ of the region to Paraguay. The reasons for Bolivia’s defeat can be put down to a chaotic political system (during the war there was a coup which was the 34th in 107 years), weak military command, poor intelligence, a lack of motivation in the army and isolation. On the other hand, Paraguay had a superior officer corps, sympathetic neighbors and the war was fought near the Paraguayan heartlands, minimizing supply lines in one of the world’s driest areas. Professor Matthew Hughes from Brunel University of London, defined the war as “a training ground – a South American Spanish Civil War – for the Second World War, although it was not clear what lessons, if any, the protagonists of the Second World War drew from the Chaco War”. As in the Spanish Civil War and the early stages of the Second World War, tanks were used to support infantry and as individual entities rather than in groups. 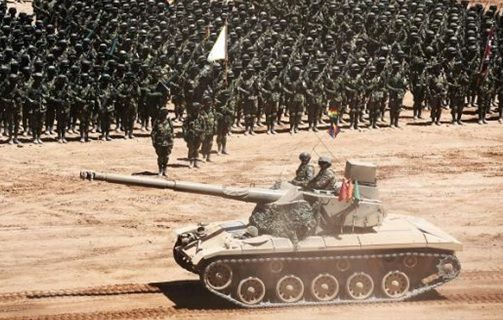 In Bolivia’s case, this can be excused due to the small number of tanks at their disposal. A contemporary account can be found in an article for Blackword Magazine in April 1934 by George Laden. Laden was a British Army officer who was on leave in Bolivia in 1933 and described that “for without observation or room to maneuver, such arms as artillery, tanks and even airplanes can be of little value. Indeed, the Bolivians, who relied to a great extent on these arms to compensate them for their other disadvantages, have been somewhat disillusioned, and it is to their credit that their morale remained unshaken when the results they hoped for failed to materialize”. 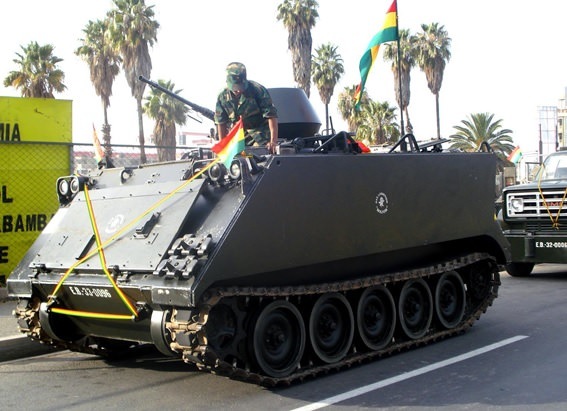 In general, Bolivia showed a will to adapt to new warfare with their use of tanks. These were crewed by Bolivian volunteers who underwent eight weeks training and a series of German, Austrian and American mercenaries. One conclusion to be drawn from the war and which would be further highlighted in Spain and across Europe in the years to come was the limited use to which tankettes could be put. Multiple turreted tanks also proved to be inferior to their single turret counterparts. 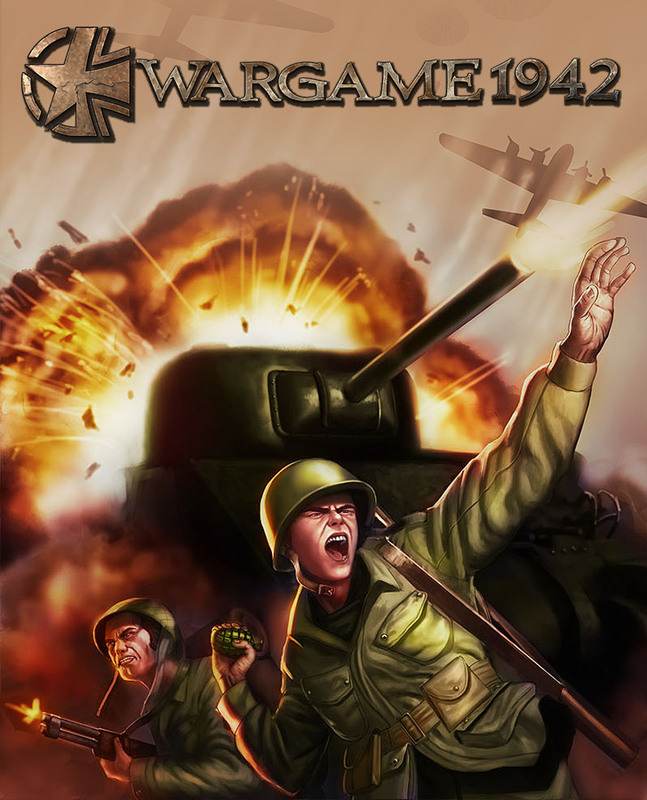 The end of the war brought even greater political instability but the Second World War gave the Bolivian economy a boost and exports of tin, tungsten and rubber increased. In April 1943, under American pressure, Bolivia declared war on the Axis Powers, though prior to this and even afterward, they were accused of being sympathetic to the Nazis due to anti-Semitic tendencies held by certain sectors of Bolivian society. The declaration was merely symbolic and Bolivia never contributed militarily to the war effort. Post-war, through the Lend-Lease program, Bolivia received at least 12 M3A1’s and as many as 24 M3 Half-tracks from the USA, some of which remain operational to this day. Political instability would continue until the revolution of 1952 during which Movimiento Nacionalista Revolucionario (MNR) took power and, with this, according to some historians and academics, Bolivia finally entered the Twentieth Century. MNR extended the suffrage to include the indigenous minorities and women, whilst at the same time redistributing the land. In 1964, this new democracy gave way to a military junta violently opposed by portions of the population. They were aided in their struggle by the Argentinian-born Cuban revolutionary and cult hero Ernesto ‘Che’ Guevara, who was killed in 1967 by CIA-assisted Bolivian Special Forces. Democracy would be restored in 1982, but no Presidents would manage to hold their posts for more than 5 years until the Presidency of Evo Morales, elected in 2006 and still in office today. 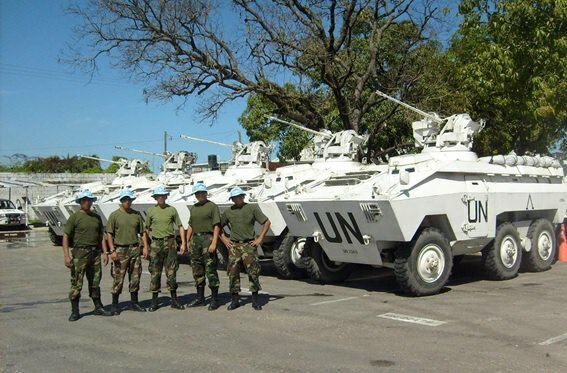 Dealing with internal matters in both 1952 and 1966-67 aside, the Bolivian Armed Forces have only been operational as part of UN Peace Missions on 17 occasions and serving with distinction as part of MONUSCO in Democratic Republic of the Congo in 2001 and UNSTAMIH in Haiti from 2006 to the present. 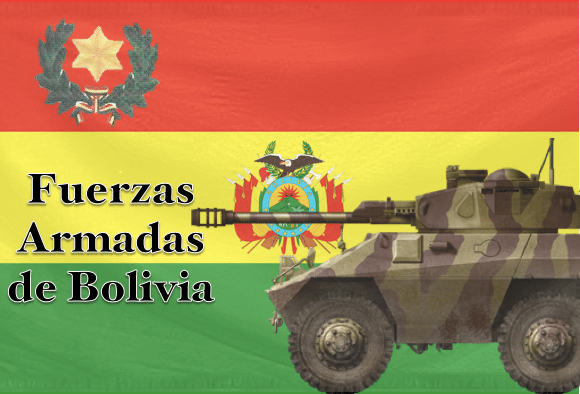 Bolivia’s Armed Forces are divided into 3 branches: Army, Air Force and Navy (despite being landlocked, Bolivia has a number of small vessels for river and lake patrol). 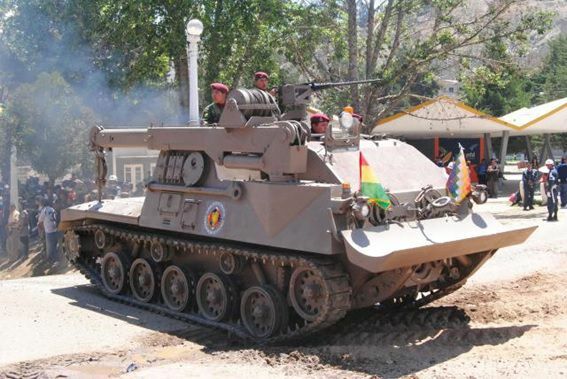 Most of Bolivia’s AFV’s are part of the División Mecanizada 1. 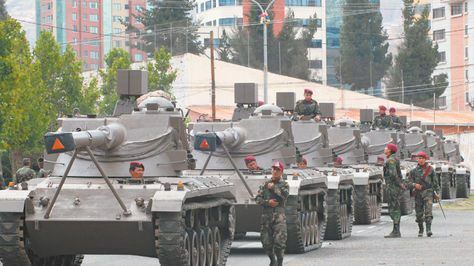 Within it, the main tank force is part of Regimento de Caballería 1 equipped with SK-105 Kürassier’s. The Regimento de Caballería 4 is a mechanized cavalry division with the wheeled Brazilian vehicles. This division also includes the 10 V-150 Commandos as part of the Regimento de Caballería 2. Other AFV’s can be found in motorized infantry regiments, as for example the M113’s in the Regimento de Infantería 26 (7th Army Division) or Regimento de Infantería 10 (8th Army Division). 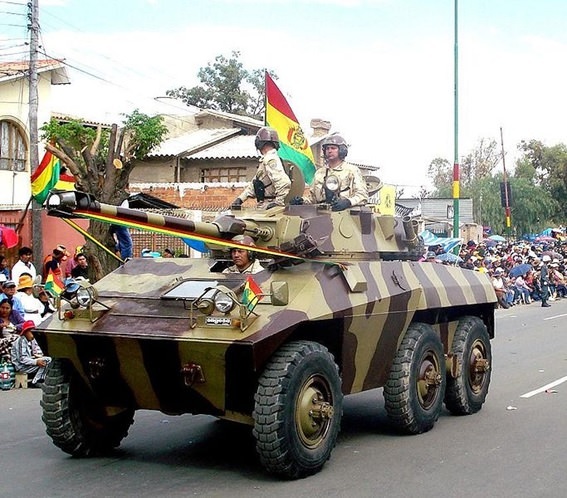 Throughout history, the camouflage scheme on Bolivian AFV’s has changed. Initially, during the Chaco War, it was a dark green base with sand and red-brown bands. The Carden-Loyd remained just dark green. After the war, black replaced sand in camouflages. These days, there are varieties. Most units have a reseda green single tone camouflage, but other vehicles, most notably the EE-9 Cascavel’s, have a two-tone red-brown and sand pattern. Most vehicles include the crest of arms of the Bolivian Army on their sides. 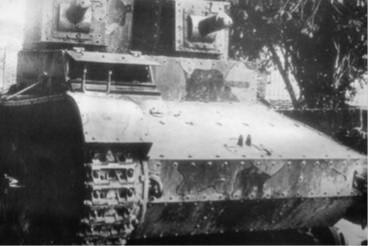 Two were purchased in 1932 from the Vickers company and they were reported to have been used at the Battle of Boquerón in September 1932, making it the first tank to be used in combat in South America. One was lost during the Second Battle of Nanawa and the other one got stuck in a trench but was later recovered. Their tactical value in the war was minimal and showed the limitations of this type of tank. Three (one Type A and two Type B) were purchased from Vickers in 1932 and introduced into combat debut in July 1933 at the Second Battle of Nanawa, where one was destroyed. The other two would later be captured by Paraguayan forces in December 1933. 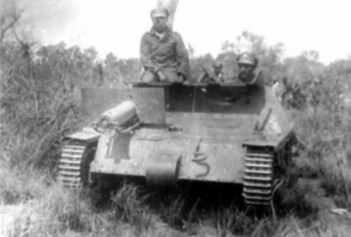 These, especially the Type B variant, proved to be the superior tank of the war being able to withstand any Paraguayan small arms fire and have enough firepower to destroy their defensive positions. 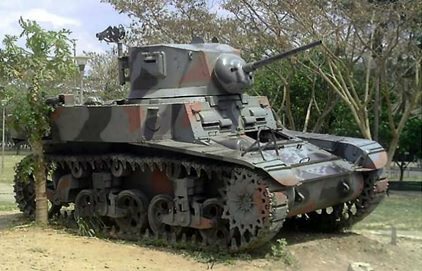 The captured Type A, along with the turret of the destroyed Type B, were given back to Bolivia in 1994 as a symbol of goodwill. As many as 14 of these Italian light tanks were purchased sometime between 1934 and 1935 and could have fought in the last battle of the war at Villamontes, though there is no factual evidence to support this and their fate is unknown. Twelve were delivered as part of Lend-Lease from the USA at the end of the 1940’s and served as Bolivia’s main tank-force for almost 3 decades. Although not operational, several remain on display as monuments. Sometimes incorrectly referred to as M9’s. 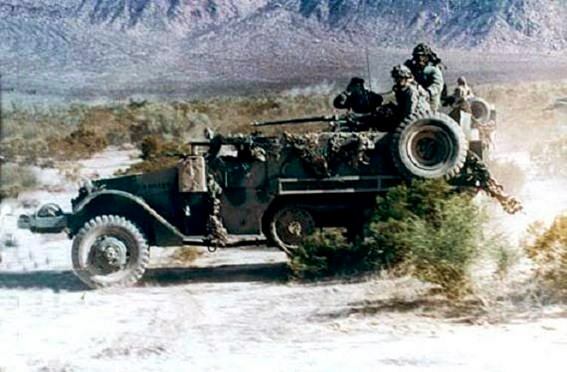 24 were sent as part of Lend-Lease alongside the M3A1 light tanks and some remain operational to this day as troop transporters, though several more modern options are now available. Twenty-four of these vehicles were bought in 1967 from Switzerland and assigned to the Military Police. It is unknown if this Armored Personnel Carrier arrived in time to be used against the ‘Che’ Guevara led insurgents. 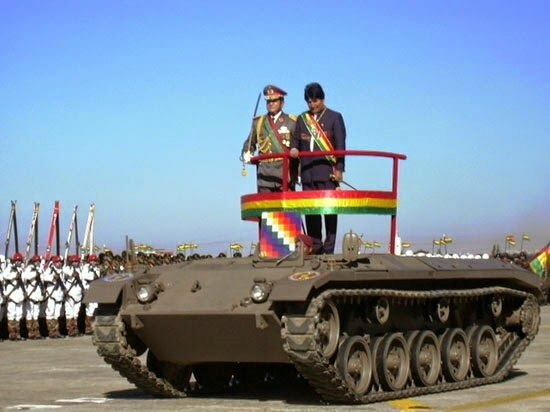 It represented the first new Bolivian AFV in almost two decades. Three remained operational in 2008. Purchased from the US firm of Cadillac in 1970. There is some discrepancy over the exact number bought, with some sources giving the number as 10 whilst others give 7, but there was a further order for 7 of the V-150 version. Between 44 and 50 of the famous APC were purchased from the USA in 1971-72. It is possible that these had served in Vietnam and they are of the M113A1 variant. Bolivia ordered 6 of the Austrian alternative to the M113 APC in 1977 and they were delivered the following year. 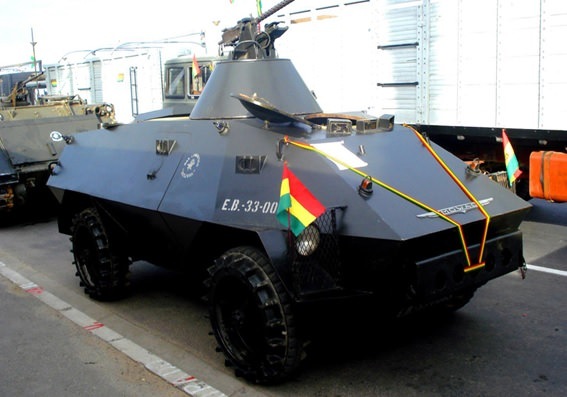 This made Bolivia, along with Greece, the only countries to have the two models of APC. Apparently, none remain in service. Thirty-four of the main variant plus 2 GRIEF ARV variants were ordered in 1978 and delivered over the following two years. 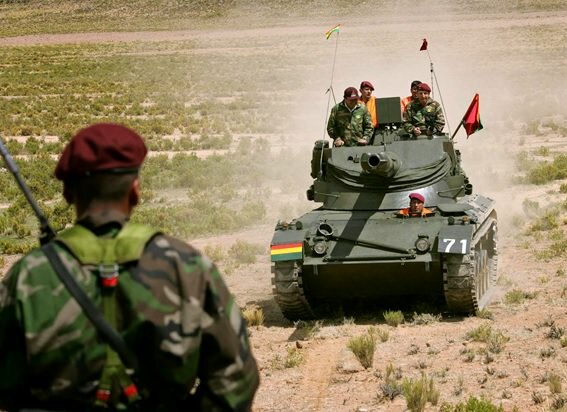 Still in service, they remain the main tank of the Bolivian Armed Forces. At least 1 has been modified with its turret removed to serve as a mobile platform or command vehicle. They were modernized in 2009. Twenty-four EE-9 Cascavel II’s were bought from the Brazilian company Engesa in 1977 and were delivered between 1979 and 1980. Still in service with at least 4 being modernized in Brazil in 2013, they serve as a wheeled alternative to the SK-105 Kürassier. Since 2013, there have been negotiations to substitute these with the Italo-Brazilian VBTP-MR Guarani, though these orders have not materialized and with the Chinese Tigers arriving in 2016, it is unlikely that they will be acquired. Closely related to the EE-9 Cascavel, 24 of these were purchased from Engesa at the same time as its cousin. Still active, they slowly replaced other APC’s. Since 2013, there have been negotiations to substitute these with the Italo-Brazilian VBTP-MR Guarani, though these orders have not materialized and with the Chinese Tigers arriving in 2016, it is unlikely that they will be acquired. 5 ordered in 1980 and delivered the following year. Around 50 thought to have been purchased from Venezuela in the last 5 years, though it is unknown in which variants. 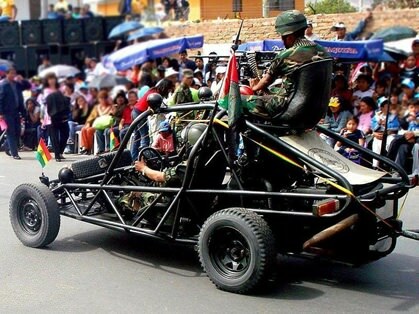 This light utility vehicle is an indigenous Venezuelan design and an alternative to the American HMMWV for countries with uneasy relations with the USA. 27 gifted by China as aid to Bolivia in 2016. 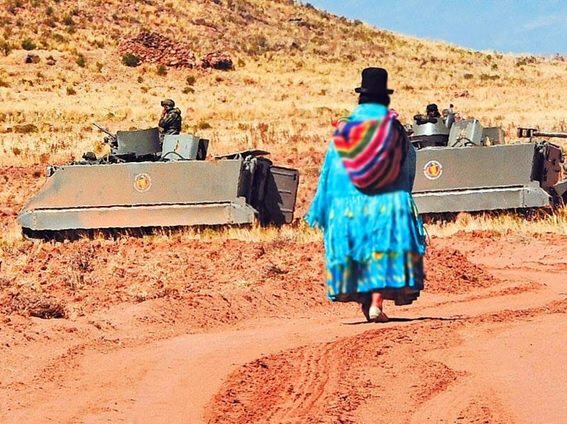 Bolivia’s only ever indigenous fighting vehicle. 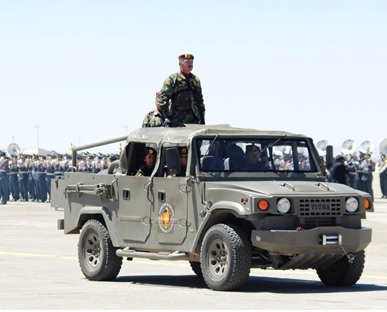 Built to serve as a multipurpose vehicle capable of carrying different weapons for different jobs. Work on its prototype began in 1995, but it was not completed in an improved version until 2005. Apparently, there are two used by the Bolivian Armed Forces. i am,, relatively new to this site so may have missed it but i was surprised to see no reference in the Americas section to Peru’s use of what I refer to as the Panzer 38, not knowing its Czech designation. My sister and I were in Peru several years ago and saw one on display in a small city in the Amazon. Equitos, maybe. they were apparently up gunned at some point b/c the barrel was noticeably longer. was not something I was expecting to see on my trip. An article on that is currently in the works, you’ll just have to wait! The peruvian version is known as LTP. 25 were purchazed from Czechoslovakia in 1938 and received just before Germany took control of czech factories. A company of 11 fought in the 1941 peruvian-ecuatorian war. I am a fan of the Pz 38t, & am aware of these tanks aswell. This is just off the top of my head as & read the information a while ago. I believe that around 8 of what bacame the Pz 38T were sold by the Czechs, to peru just before the start of the war, & they were actually used in combat. There are apperently 3 on display at the Real Felipe Fortress situated in Lima, Peru. Here is a link to a 3 min youtube video that shows those 3 aswell as a lot of other surviving check 35t & 38t tanks aswell. It is given the designation LTP tank in this video. Hope this gives you something to follow. I learn’t while reading about wot- a game I play- about a tank called the M41B Brazilian Bulldog which is said to have a new 90mm cannon, replaced engine and upgraded transmission. I believe that maybe Brazil made more tanks which haven’t been featured on tank encyclopedia. This is my first comment on tanks encyclopedia and I am proud to have joined the community.